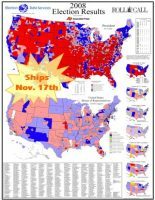 Because for the first time information has been printed on the back, if you have the wall space, now is the time to get two copies of our 2010 Election Results Poster for the price of only 1.6 maps. Folded version Individual posters are 43” high x 30.5” wide. 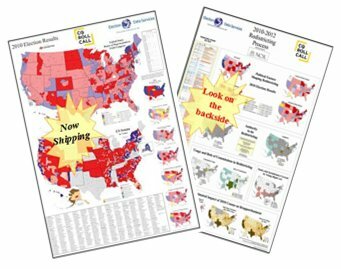 The 2010 poster featured a back side totally devoted to the redistricting process that followed the 2010 Census results release. It included key elements of the 2011-2014 Redistricting process, detailed chronologically sorted calendar of events, who has the authority to do redistricting, by state, the roll of Commissions, coverage of Sec 5 of Voting Rights Act, and the anticipated impact of the 2010 Census on Reapportionment.